Many librarians, like many people, are quite content to do what’s been traditionally expected of them. They fill the roles they’ve been given and, perhaps, they fill those roles well. Small minorities, however, reach out beyond these roles and show us the possibilities for what librarianship can be. They are models for the rest of us. They show us what creative practice can be. 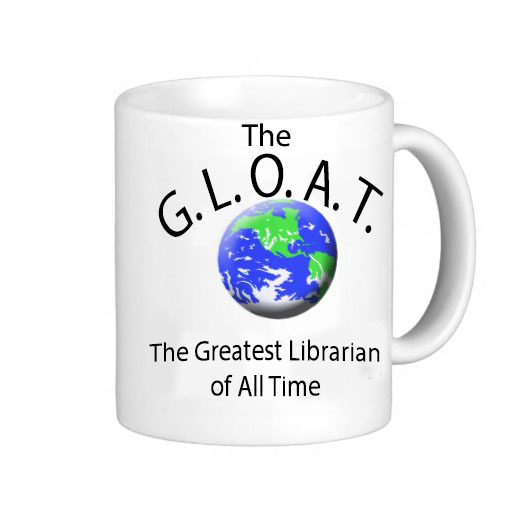 One such model is a librarian so creative in his practical innovations that the only suitable moniker for the man is that he must be hereby christened the “G.L.O.A.T” – the Greatest Librarian of All Time. Ladies and gentlemen, please allow me to officially introduce you to the G.L.O.A.T. –David K. Maxfield (1913-2001). The brief biographical sketch I’ve been able to locate indicates that Maxfield had a pretty traditional librarian upbringing: he received a B.S. in Library Science from Columbia University in New York, worked as a librarian for a while, and then finished his M.L.S. at Columbia in 1946. He worked at the Undergraduate Division of the University of Illinois at Chicago Library; received tenure there in 1952, and, later, took a job at the University of Michigan, where he was head of the Medical Center Library until he retired from the field in 1977. This is as much as I’ve been able to find about the basic facts of David K. Maxfield as a man – although his work speaks volumes about who he really was. David K. Maxfield, “Counseling Librarianship: A New Departure,” University of Illinois Library School, Occasional Papers: No 38, March 1954. David K. Maxfield, “Counselor Librarianship at U.I.C,” College & Research Libraries 15, 161-166: 1954. – but these papers crush it so hard they’re enough to establish a legacy. Conventional reference work does not always place quite so much emphasis upon the library patron as an individual person as it does upon library materials and bibliographic techniques (162). College librarians perhaps should give more careful attention to the individual needs of their undergraduate patrons (162). when the inquirer is met as a unique individual, rather than as a mere consumer of bibliographic materials and techniques, his question may involve unexpected discoveries (164). which discoveries go toward educating the whole person, not just providing them with whatever information they happen to request. This is all well and good, but Maxwell’s claim to not ever even having to watch the throne – because it’s hard to imagine a librarian ever coming close to this level of innovation – rests on his actual practical advances at U.I.C. In order to help prepare librarians to be more student-centered, he actually had his reference & instruction staff train to become professional counselors with U.I.C.’s Student Counseling Bureau. He then changed the name of the Reference Department to “The Department of Library Instruction and Advisement,” hired several librarians who “considered counselor librarianship to be a positive educational force, and who were believed to have: enthusiastic interest in young people and their personal development” (162) and who also then completed a professional counselor training program at U.I.C. (and worked part time at the U.I.C. counseling center). The counselor librarians increased the circulation of books at U.I.C., use of reference materials in the reading room, increased their reference questions, and were enormously successful with students and faculty. Now here’s the question I want you to think about when you consider why this makes Maxfield the Greatest Librarian of All Time: can you even imagine trying to implement this in your library? Can you even possible imagine the resistance you would get? But Maxfield did it, and did it well. At a university in the Mid-West in the early Nineteen-Fifties. Both [the student’s] intellectual development and his all-around personal growth. It is “student-centered” (Counselor Librarianship: A New Departure, p. 11). Maxfield didn’t shy away from what educational psychologists now know: that emotional intelligence, persistence, effort, grit – and not “intelligence” – are the key factors that help students succeed. And he understood, from his own reading of humanistic psychology, some of the major factors that motivate students, such as having their autonomy supported. He understood this, I would imagine, because his curiosity about what makes people tick led him to think about those issues in a serious way, and he had the courage to apply what he knew to his professional practice. And this is exactly what is required if we want to be student-centered in the classroom. If student-centered reference and instruction involves, well, putting students first, it must mean that we take an interest in understanding what motivates students and how they process information. This means that librarians must have knowledge and an interest in both the psychology of motivation and the cognitive science of learning. For, if we have any hope of being student-centered, we must understand how our students learn, what motivates human beings in and out of the classroom, and then tailor our instruction accordingly. Maxfield sets another example: he had this knowledge, and it’s not like he systematically learned it during college or library school: he just just curious, and learned what was relevant to his practice because of that. And Maxfield not only had such knowledge, but he sought to put it into practice. His solution may not have been the best one, but he thought in the right kind of way. He was an innovator in the best possible sense – his genuine interest in people fundamentally informed his approach to librarianship. For me this makes him stand out model for the rest of us, and earns him the official title of the G.L.O.A.T. : The Greatest Librarian of All Time.